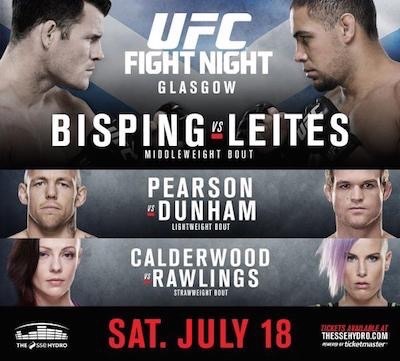 UFC Fight Night comes from Glasgow in Scotland tomorrow afternoon where English Middleweight Michael Bisping, who has not lost on home soil for 5 years will take on Thales Leites in the Main Event. The co-main event will see lighweight Evan Dunham face durable, hard-hitting Ross Pearson. In a change to the only female bout on the card Scotland’s Joanne Calderwood will be facing American Cortney Casey due to Australian Bec Rawlings having to withdraw from the card due to injury on eight-day’s notice. Before any of the fights can take place they all have to step onto the scale first. BT Sports subscribers can watch the event live via the APP starting at 3pm or on TAPE DELAY on BT Sports TV at 9pm in the UK.